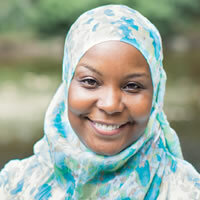 Kameelah is the Founder and President of Muslim Wellness Foundation (MWF), a nonprofit organization dedicated to promoting healing and emotional well-being in the American Muslim community through dialogue, education, and training. Muslim Wellness Foundation envisions a future in which faith communities are at the forefront of mental health advocacy and committed to developing an inclusive culture of compassion, understanding, and holistic health. Kameelah also serves as the Fellow for Spirituality, Wellness and Social Justice at the University of Pennsylvania (UPenn) and advisor for Penn Sapelo, the first Black Muslim Student organization on campus. In this capacity, Kameelah supports students in their exploration of faith-based activism, spirituality, emotional well-being, and healing. Working in conjunction with the Chaplain’s Office, she collaborates with other cultural centers on campus to facilitate intersectional conversations on race, religion, identity, belonging, and advocacy. Kameelah served three years as the Muslim Chaplain at UPenn and continues to facilitate discussions on religious identity development and challenges faced by American Muslim youth. She is also a resource to the wider Penn community and administration on Islam and Muslims. In addition to Kameelah’s involvement in mental health advocacy and religious life, she is a proud social justice activist and founding member of Muslims Make It Plain, a coalition of concerned Muslims working to inspire, empower, and support grassroots mobilization and direct action to address police brutality, racial and religious profiling, unlawful surveillance, and the overpolicing of America’s Black and Brown communities. In December 2014, Muslims Make It Plain organized the first Muslim-led rally and march in the country in support of BlackLivesMatter. Kameelah serves as a board member of Muslim Advocates, a national legal advocacy and educational organization that works on the frontlines of civil rights to guarantee freedom and justice for Americans of all faiths. Further, Kameelah is an advisory board member of Stony Point Center, Social Health & Medical Services (SHAMS) Clinic and the Husayn Center for Social Justice, a Muslim-run social services and advocacy center that promotes health and wellness for the residents of Trenton, NJ. Kameelah is a 2014 Ariane deRothschild Fellow and a recipient of the 2014 Student Multiculturalism and Salter Family Memorial Education Awards and the 2017 Matthew Smith Education Award from the Pennsylvania Psychological Association (PPA). Since 2015, Kameelah has served as the Diversity Focus Chair for PPA’s Graduate Student Board. National Council for Behavioral Health selected Kameelah for the prestigious 2015 Mental Health First Aid (MHFA) Community Impact Award and honored her as a “passionate, committed, and outstanding behavioral health leader.” President and CEO Linda Rosenberg offered the following praise: “Kameelah facilitates…with sensitivity to the religious, spiritual and sociocultural context in which Muslims experience and understand the underlying factors that contribute to…lack of emotional well being.” Kameelah was also selected by El-Hibri Foundation for the 2017 Community Builder Award for her innovative work to build capacity of American Muslim communities to improve mental health and wellness and promote more inclusive norms. Kameelah’s clinical and research areas of interest include: spirituality in psychotherapy; wellness and community resource building; storytelling as a way of facilitating connection; healing and closure in family of origin; mental health stigma in faith and minority communities; first-generation college students and emerging adults of color; diversity, religious identity, and multicultural issues in counseling; healing justice and faith-based activism; racial trauma and healing; psychological impact of anti-Muslim bigotry and anti-Blackness; Black Muslim psychology and Black Muslim intersectional invisibility. Kameelah’s insights and perspectives have been featured in The Huffington Post, The Atlantic, BuzzFeed, Patheos-Muslim, MuslimMatters, The Pennsylvania Gazette, and NPR’s Radio Times with Marty Moss-Coane. Kameelah graduated from the University of Pennsylvania with a BA in Psychology and MEd in Psychological Services. She has pursued further graduate education, completing a second Master’s in Restorative Practices & Youth Counseling (MRP) from the International Institute for Restorative Practices and obtaining a post-master’s certificate in Family Therapy from the Philadelphia Child & Family Therapy Training Center. Kameelah is a certified instructor in Adult, Higher Education & Youth Mental Health First Aid. She is pursuing her doctorate in Clinical Psychology at Chestnut Hill College in Philadelphia, PA.